After the Ebola virus outbreak in West Africa, Rebecca Monnier is getting her second chance at being a Peace Corps Volunteer in Liberia. The Bellevue, Nebraska, native departed June 6 for Liberia to begin her two-year service as an Education Volunteer. Monnier, 24, is actually returning to Peace Corps Liberia, having arrived in country nearly two years prior. However, after just seven weeks in country, the agency suspended its program due to the Ebola epidemic. Her service was over before it even started. "I have never in my life felt more welcome or at home in any place other than in my actual home than I did in Liberia." While studying business administration at Concordia University Nebraska, Monnier earned a fellowship through Lutheran World Relief to Tanzania to study malaria programming. She led a fundraising campaign to raise $100,000 in support of malaria prevention efforts in Africa. 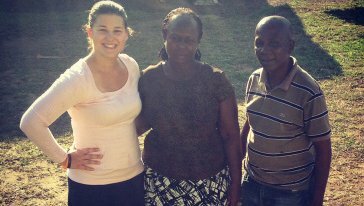 This project, along with trips to Costa Rica, Zambia, and China, inspired her to pursue a career in international development. After graduating, Monnier left for Liberia to begin three months of pre-service training to become an Education Volunteer. Almost immediately, she fell in love with the country. However, in December 2013, an outbreak of Ebola started to spread through Liberia, Sierra Leone and Guinea, and as the devastation escalated, Peace Corps decided to evacuate all Volunteers from those three countries to ensure their health and safety. Monnier left Liberia August 1, 2014, eight days before the World Health Organization declared the Ebola epidemic an international health emergency, and was temporarily sent back to the U.S. awaiting updates from Peace Corps. With the risk of returning to the Ebola-impacted countries still too great, the agency officially closed the services of all evacuated Volunteers in October. Back in the U.S. Monnier was conflicted about leaving her new home and watching the continued struggles from afar. Monnier lived with her parents in Nebraska and made time to visit her grandparents and extended family. She also took the opportunity to gain additional experiences, working as a supervisor at a community center in Omaha and as the interim director of student life and services at Nebraska Christian College in Papillion. In June 2015, when new cases of Ebola ceased and after careful consideration and consultation with Congress and in-country partners, Peace Corps returned to Liberia with a small group of experienced Peace Corps Response Volunteers. Shortly after, the agency posted two-year positions in Liberia, and Monnier applied and was invited to serve. She will return as a Community Services Education Volunteer and will work at the community level teaching basic math concepts to students grades 7 through 12. 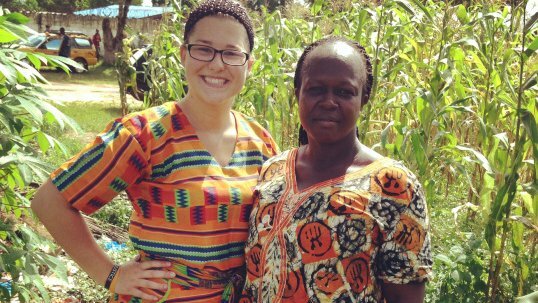 During the first three months of her service, Monnier will live with a host family in Liberia to learn the local language and integrate into the culture. After acquiring the language and cultural skills that will help her make a lasting difference, Monnier will be sworn into service and assigned to a community in Liberia where she will serve for two years. Monnier will work in cooperation with the local people and partner organizations on sustainable, community-based development projects that improve the lives of people in Liberia and help Monnier develop leadership, technical and cross-cultural skills that will give her a competitive edge when she returns home. Peace Corps Volunteers return from service as global citizens well-positioned for professional opportunities in today’s global job market.